Homo? Humus. Fama? Fumus. Finis? Cinis. A simple post for a simple day with a simple reminder: Life is short. The title of today’s chapter is actually an old medieval meditation, recorded by author Giovanni Papini. The brevity of human life, condensed into six words. Translated: Man is dust. Fame is smoke. Ashes in the end. We are made of stuff of this earth and we are destined to return to it. We are now in the season of Lent, forty days that ultimately remind us to love each day. Find some ceremony in every one of them. 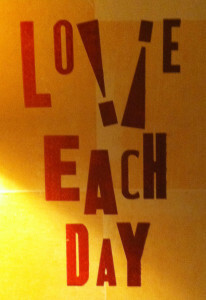 Image: Love Each Day broadside, designed in handset wood type by William J. Landis, printed letterpress on the 1890 Wesel Iron Handpress at the Jaffe Center for Book Arts, Boca Raton, Florida, 2013.